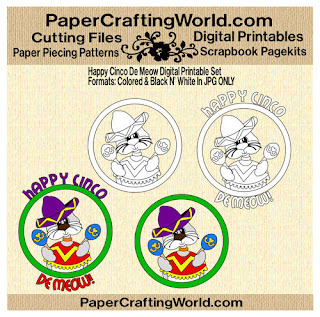 Good morning crafty friends and Happy Cinco De Mayo! I was speaking with our DT Coordinator Jen and I mentioned that I wanted to do something for the Cinco De Mayo celebration. I hadn’t really thought of anything and she mentioned that her local pet shelter was having a Cinco De Meow adoption event. I LOVE animals.....especially Dogs. I would gladly have some kitties in my life too....BUT my hubby is VERY allergic to them. His mom has some and the poor guy really has a tough time when he goes to visit her. Anyway, I thought it was such a cute idea that I decided to make a card with that theme in mind. I recently acquired the Ole cartridge and took a look at what images they had. Much to my surprise they had a cat! So here is my card. The eyes I cut from smaller ovals. I generally don’t care for the facial features on most of the Cricut cuts, so I will “improvise” and add my own “eyes” mostly. So please consider making a home for a pet if you don’t already have one. With our economy being what it is, even the poor animals are feeling the pinch. If you already have a beloved animal in your life then make sure to give them a big fat hug! Here is a picture of my “baby” She is a spoiled girl to say the least! Plus as it turns out, we found a stray so here is a picture of “Tyson” He is a loveable dog and very good natured. He is already “fixed”. The animal control guy said that he didn’t think they would have too much trouble finding him a forever home, but in the off chance that they can’t, my husband took a liking to him and so he may be back......Ay ya yah Caramba....Three dogs! So I am praying he finds a nice home that maybe isn’t ours....rofl! PLUS I am currently dog-sitting my brother’s new puppy. His name is Karamel Frappuchino.....He is a little cutie. Here is a picture of him. It was hard to get a good pic of him because he is so squirmy! Okay, I know this wasn’t a seriously “crafty” post, so to make up for having to suffer through my personal fur-baby ramblings...I thought I would give you all a free digi stamp set. 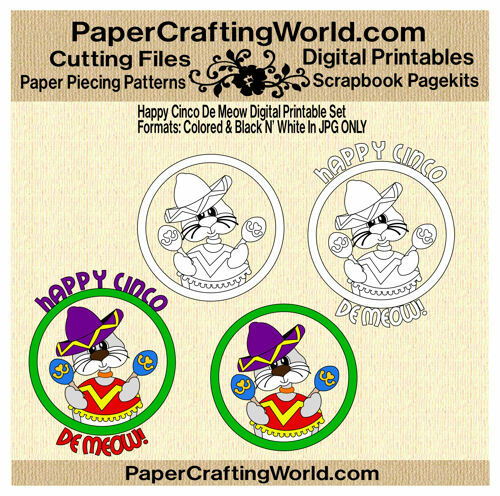 It is my version of a Happy Cinco De Meow set! There are four images two pre-colored as shown and two black and white. Each set is with and without the sentiment for a total of four images. Just click the add to cart button. It will not cost you anything to check out during the free offer. Love this Melin! I am an animal lover too, and so appreciate the adoption message! Your fur family is simply adorable!! Thank you for the free stamp! Oh Melin, This is just a fabulous card. The bright colors could not be better. I love that little kitty and the MEOW is so fun! Melin, I love the little furbabies. I only wish all had good loving homes. I am such an advocate for animals and am so glad that you are too. Better late than never! Thank you for this cute cinco de meow image! !